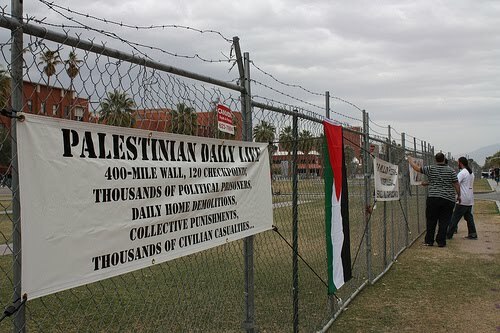 Students at the UA made history last month when they erected the largest (1200-ft) mock apartheid wall in the U.S. to divide their more than 50,000-person campus in protest of American policies of support for Israel’s 44-year military occupation and settlement of Palestinian ancestral lands and of U.S. Immigration and border enforcement. Students also released their statement advocating divestment from UA-partnered corporations enabling such policies. The Associated Press first picked up the story of their mock wall on Mar. 19. Archbishop Tutu heard about the students’ wall and divestment initiative and offered his support, at the invitation of the students. The student statement was dated Mar. 28 by the student group, No Más Muertes (UA NMM), and marks the first public U.S.-university based call for divestment or boycott from corporations supporting racist policies and practices against Latina/o migrant communities and indigenous peoples in AZ and nationwide. Their divestment call is modeled from the current global movement of Boycott, Divestment, and Sanctions (BDS) against Israel. Tutu’s letter intentionally dated on Land Day (Mar. 30), also known as international BDS day, commemorating the day in 1976 when Israeli forces shot and killed six young Palestinian citizens of Israel protesting continuing illegal military occupation and settlement of Palestine. Students, however, are already way ahead of him. Following the UA’s “Concrete Connections” wall last month, similar mock walls are being erected across the country at institutions as diverse as Brown University, the University of New Mexico (UNM), The Evergreen State College (TESC), UMass Amherst, and others. Many of the organizers have been coordinating cross-country over the past year to launch their walls.